ROCKABILLY, rock'n'roll and ROCKBOTTOM are all you need to know when it comes to learning your three Rs. The four-piece combo rework the era of late 1950s rock'n'roll, rockabilly and blues and they are mixing their styles at Newcastle's Northern Star Hotel this Friday. 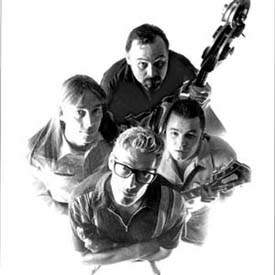 All veterans of the Melbourne blues scene, ROCKBOTTOM JAMES AND THE DETONATORS includes Rockbottom James himself on vocals/harmonica; Doghouse Dave Phillpott (double bass); Paulie 'The Kid' Bignell (guitar) and TT Slim on drums. Three of the four played together for more than 15 years with the ROCKET 88s, one of Melbourne's longest serving outfits. Their simple marriage of blasting amplified harmonica with hollow body work is underpinned by the bull-fiddle bass and what has been labelled the best shuffle drumming in Australia. They churn together the sounds of CHUCK BERRY , OTIS RUSH , EDDIE COCHRANE and LITTLE WALTER, among others. Their latest album release, EVERYBODY STAY CALM, follows last year's BLOW IT UP voted one of the top five blues albums of 1998 by RHYTHMS magazine.